Wage theft is a serious crime, and it affects millions of workers. 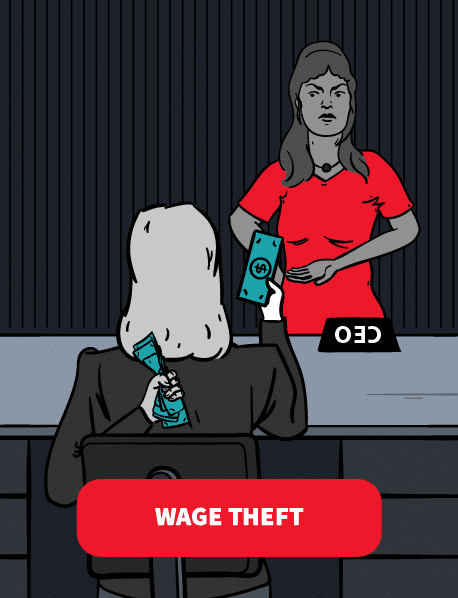 Several laws protect workers against wage theft. These include the Fair Labor Standards Act (FLSA), New York State Labor Law, and a variety of other laws and regulations. If your employer violated your rights, a New York wage theft lawyer can help. The most common forms of wage theft include paying employees less than the minimum wage and not paying for overtime. However, other forms of wage theft cost employees millions of dollars every year. These seven common forms of wage theft are all illegal. Deducting pay for meal breaks may violate the law. Under New York state law, employees must receive meal breaks. State law grants employees an unpaid half-hour lunch break when they work a shift of more than six hours. The six hours must include the period between 11:00 a.m. and 2:00 p.m. If the shift starts before 11:00 a.m. and ends after 7:00 p.m., employees must receive another 20-minute break between 5:00 p.m. and 7:00 p.m.
Employees who work a shift of more than six hours that starts between 1:00 p.m. and 6:00 a.m must receive a 45-minute break in the middle of their shift. Some employees must receive paid meal breaks. Employers must pay for breaks if you have to perform any work during the break time. This can include checking work emails or answering phone calls. However, if you do not have to do any work, meal breaks are unpaid. In addition to meal breaks, employers may provide shorter five to twenty minute breaks throughout the workday. If your employer offers short breaks, these are considered part of the workday. You must receive your regular wages for this time. Employers cannot automatically deduct unpaid meal breaks, which may violate wage theft laws. If work regularly interrupts your meal break, your employer owes you money for that time, plus fines and penalties. Your employer cannot make certain deductions from your paycheck. Employers can deduct wages when required by law, such as income taxes or Social Security taxes. They can also take deductions for your benefit, like health insurance, pension contributions, or other perks. In all other cases, your employer must ask for your agreement in writing before taking deductions from your wages. These illegal deductions may also violate minimum wage protections. It is also against the law for your employer to ask for kickbacks. In other words, employers cannot demand part of your wages by threatening your job. Employers must pay their employees for all hours worked. If you arrive at work at 8:55 a.m. every day, but your computer takes twenty minutes to install updates before you can officially clock in, you are still entitled to wages for those twenty minutes. These rules apply to all employees, including office workers. The legislation itself uses the examples of a lathe operator who starts the workday oiling, greasing, or cleaning his machine, and a garment worker who shows up 30 minutes before others to get machines ready for operation. However, call center workers, for example, must receive wages for time spent downloading work instructions, computer applications, and work-related emails. Overtime laws guarantee additional pay for certain employees, but employers may misuse the classification system. Misclassification is a serious problem that can cause significant lost wages. If an employee has been improperly classified as overtime exempt, they must receive back wages. For more, see the Overtime article. The FLSA de­fines the term “employ” very broadly. This includes everyone that employers “suffer or permit to work.” Employees must receive compensation for the services they perform for an employer. However, some employers unfairly abuse unpaid interns. Recently, several cases challenged the issue of whether interns should be classified as employees under the FLSA. In the for-profit private sector, employers can only offer unpaid internships or training programs under very specific circumstances. The DOL sets specific criteria that must be met in order to classify someone as an unpaid intern. If these criteria are not met, the individual is an employee and they are owed wages. The internship, even though it includes actual operation of the facilities of the employer, is similar to training which would be given in an education environment. The internship experience is for the bene­fit of the intern (for example, the intern earns college credit). The employer that provides the training derives no immediate advantage from the activities of the intern and, on occasion, its operations may actually be impeded. New York state uses a similar standard. Unpaid internships that violate these standards are illegal, and interns should be paid and classified as employees. Employees often use mobile devices to send and receive work-related emails. Employers must pay their workers for the time reading and responding to emails and text messages while not on site. In the past, employers were not responsible for this work because of the impracticality of calculating the hours worked. Recently, the Department of Labor developed a mobile timesheet app for iPhones and iPads that provides an easy way to track hours of work. Currently, there is no available version for Android devices, but there are numerous time-keeping apps offered by other vendors. If employers do not pay employees for remote work, they are violating the the law. Wage theft laws provide fewer protections for independent contractors. However, in some cases employers misclassify independent contractors who should be employees. Misclassification is a serious problem that causes significant lost wages. If an employer inappropriately classified an employee as an independent contractor, the employee must receive back wages. For more, see the Independent Contractor article. If you are the victim of wage theft, you have rights. Every day, employers illegally deny employees money and benefits. A New York wage theft lawyer can help.